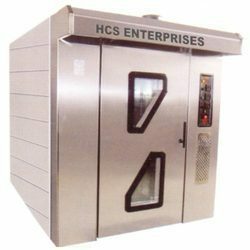 Justifying our position in the global markets, we offer a wider range of best quality rotor ovens, which are immensely used in world wide baking industries. 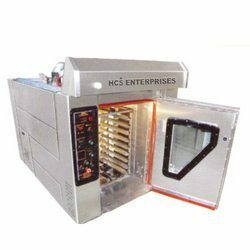 We manufacture these rack ovens keeping into consideration the European Directives, which make them highly popular amongst the global clients. We also offer complete customization to maximize the satisfaction of our esteemed clients. 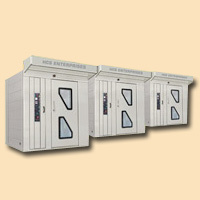 our range includes rotatory rack ovens, forced convection ovens and stainless steel rotatory rack ovens. 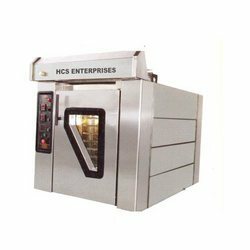 Backed by great expertise, we manufacture and export a cost effective range of Mini Ovens, which are used for warming as well as roasting purposes. These products are manufactured using latest technologiesusing hi-tech machines. Our products are perfectsolutions for baking bread as well as rolls as are widely used in the kitchens, Snack-counter, pubs, restaurants and bakery workshops. 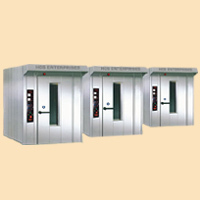 We offer these products in a variety of capacity and these products are having best quality. For technical specifications please click on the image. Baking Deck: In 304 stainless steel, Flat and easy - to - clean baking deck floor. Stainless Steel rack access ramp of moderate angle. Lighting with 3 halogen lamps. Air flow adjustment through dampers ensuring a perfectly even bake. Hot air distribution from bottom to top ensuring perfect bake and fragrance to the product. Burner: (gas version) : forced air, gas (methane of L.P.G.) or gasoil burner. Placed on the front side of the oven. 310 stainless steel heat exchanger and combustion chamber. Steam generator: With very thick steel porfiles and cascade water flow allowing placed at the back of the oven. Water supply to steam generator through bronze solenoid valves of maximum safety and durability. Regualtion (EC) No. 1935/2004 of the European Parliament and of the Council of 27 October 2004 on materials and articles intended to come into contact with food. 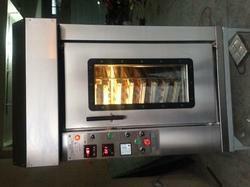 Looking for Rotor Ovens ?